Personal knitting project time. Hooray! Strangely enough, it had been so long since I knit last, I’d clean forgotten how nice knitting is. These projects were life savers – particularly in an airport when our three-hour layover kept getting longer and longer. In other news, we’re working away on the new labels for my yarns, and I’m busily getting various listings ready to roll. Once we start taking official photos, stand by for sneak peeks. Alrighty, so, I’ve finally had a week or two to mentally recover. My babysitting trip in July (ten days, four kids, and thankfully an amazing lady to work with) was good, but very physically taxing. I’m just plain not used to getting up at seven-thirty and working with children all day. And I really used to think I’d never see the day when I’d be crashing into bed as early as. . . nine. O.O Who are you and what have you done with myself? 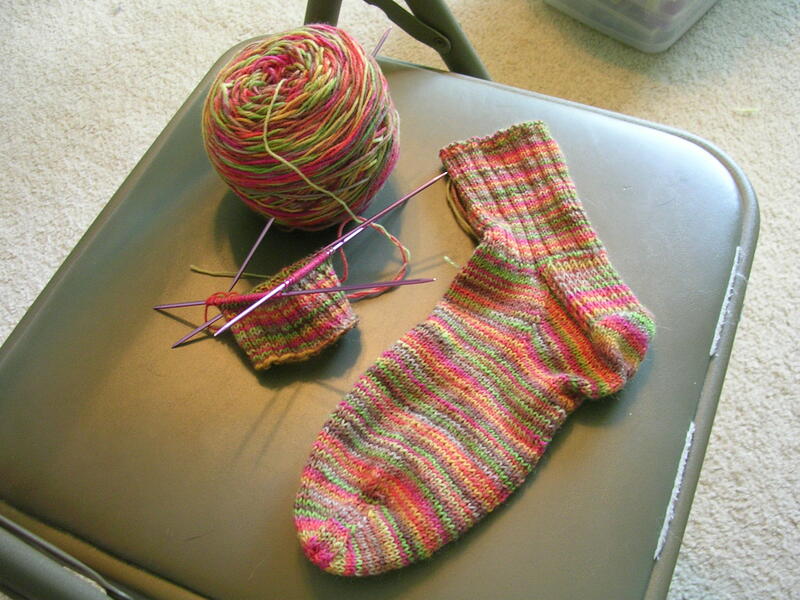 I took along a new knitting project – two color toe-ups – and maybe knit six or seven rounds max. Yes. That’s all. Like I said, I was helping watch four young children. You don’t just hunker down with two balls of yarn, pointy sticks, and colorwork. Even if it just stripes. Maybe some of you are amazing and incredible and somehow someway manage to knit fair isle lace from a chart while running a daycare center (even with the exaggeration, I’m fully ready to pass out in awe), but not this girl. It only came out during nap time or once everyone was in bed. The rest of the time it hid, trembling, in my big bag on the pantry shelf. Out of reach of the two under-five year olds, and the eight-month old Boxer puppy. Safety first, you know. I’m actually pleased with how the sock is turning out, especially the colors. When I picked the two balls of stash yarn – orange and green – I stared blankly at them for a bit, trying to figure out what I’d call them. Ravelry has changed my knitting to that extent – I must have an inventive, fun name for the project, otherwise it’s no fun. “Peas and Carrots” came to mind, as well as something of a “Pumpkin” nature, but I decided those were a little too tame. Then, keeping in mind the fall-ish tones of the colorwork, I came up with something that suited me fine. These will be my “Bushwhacked Chrysanthemum” socks, and they will be amazing. That favorite sock pattern of mine has finally been translated into English! Hooray! And, get this, I found the translation only a few hours after using a part of one of the reserved sock yarn balls for the slipper project. Argh. I was sure I had a third ball of it laying around somewhere, but now I’m not so sure. Yes, I said the slipper project. They still weren’t quite big enough and had to come home for some alterations. I’m a knitter now. Let me be the first to admit it. The dye. . . I mean die-hard crocheter has fallen. I have succumbed to the knitting realm and now have way too many knitted projects planned. Not only am I knitting my first big knitting project now — and here’s a picture of my lovely sweater so far — but I have plans for another sweater, two or three giant shawls . . . no, four or five shawls, and a myriad of socks, wraps, and various things that will only overrun my closet. Which is already overrun. Although hopefully I will be able to use things from the closet to make things which go back into the closet and therefore pioneer self-sustaining closet environments. My goal is to not. Buy. Any. More. Yarn. Until I’ve used up at least some of what I already have. Not too much. Just enough. *cough cough* Will someone please take the KnitPicks and Webs catalogs off my desk?